Andy likes to joke that I’m a hoarder. When he says this to close friends and family they chuckle or look confused. When he says this to new acquaintances or perfect strangers, I hurry whatever story he’s telling along so he can get to the punch line – which is that I hoard empty space. You see, I’m not a hoarder. If something doesn’t have a purpose then it doesn’t belong in my life. That goes for random knickknacks, souvenirs and sentimental items. Yes, I’m the girl who tossed out her wedding guest book a mere month after saying her nuptials because frankly, I didn’t see its point. I have photos, videos and memories of the people who came to share in our joy so why on earth would I need their signatures. Despite my best efforts, there are still a few things that have genuinely stumped my anti-stuff mentality. The offending items are my two most beloved childhood stuffed animals, bulky scrapbooks that I put my blood, sweat and tears into creating (not to mention some serious dough – stickers and glitter paper do not come cheap my friends) and lastly, old journals. Fortunately, I’ve come up with a plan for all of these items – save for Teddy and Bunny. Yes, those are their names; I was clearly a very creative child. My plans are as follows: old scrapbooks are slowly being converted into sleek 8×8 paperback Shutterfly books and old journals are being typed up. 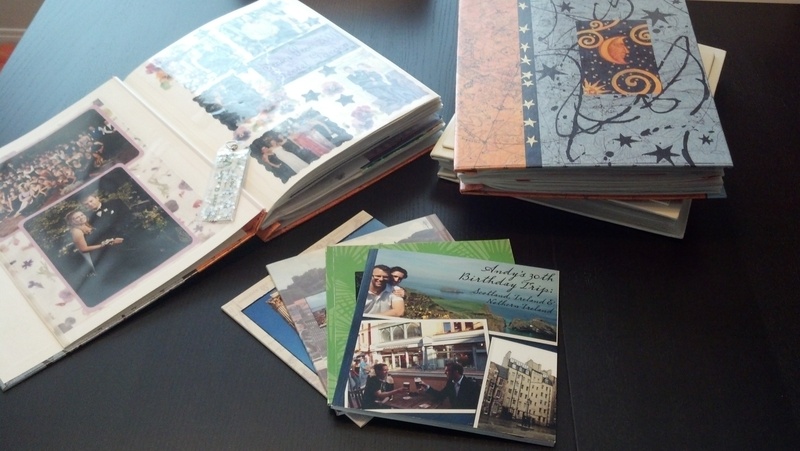 Big bulky scrapbooks vs. skinny little photo books. Ta-da! Going through my middle school, high school and college journals has been pretty weird. The gamut of emotions that have arisen might rival that of an actual middle schooler. I’ve laughed at good times and had wounds reopened from long-forgotten blows but mostly, I’ve just cringed. My long-winded rambling about something as simple as going to the movies are never-ending… what theater, what movie, what time it started, what snacks we ate, what order my friends and I sat in and so on and so on. It’s all so utterly ridiculous that it begs the question: Is this even worth keeping? One of the more puzzling parts of this whole endeavor has been trying to understand why I wrote about some seemingly mundane things and skipped over other, clearly more juicy stuff. This enigma was painfully apparent in the journal I kept while in Europe my sophomore year in college. My travel buddy Jenn and I in Europe. I think this might have been taken the first day of our trip, at the train station in Paris…. or I could be completely wrong. Also, I used to be a blonde. On March 30, 2003, I’m catching my future self up on the activities of the past few days and I go into excruciatingly tedious detail about a grocery shopping trip in Siena, Italy. My friend Jenn and I bought pasta noodles, sauce, bread, veggies and some wine and then returned to her new place to make our dinner. I talk about cooking the noodles, heating the sauce, slicing the veggies and drinking the wine. Apparently the meal was good. The commentary, however, seems pointless. Who the hell cares about all this? I was in Italy for crying out loud – in a foreign country, on my own, for the first time – and all I could find to write about was heating up marinara sauce in a microwave? You’ve got to be kidding me. In my actual recollection, the most memorable things about Siena did not include that meal – I’m not even sure if in the long run I would have remembered it had I not kept such a meticulous account. What I do remember is the city’s beauty and understanding why Crayola chose the name they did for that crayon. 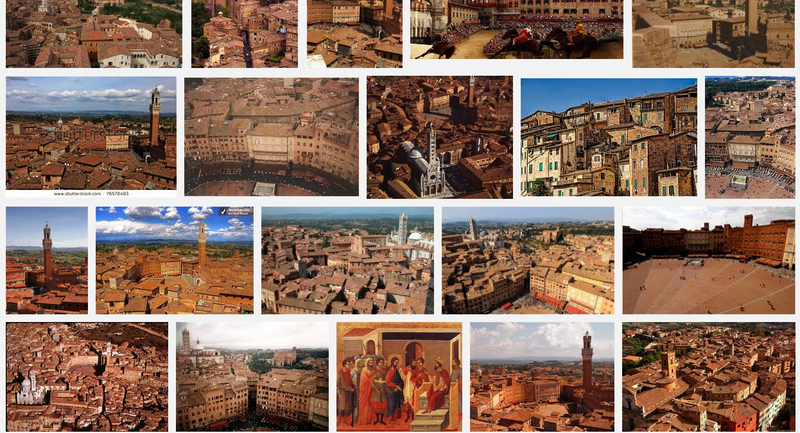 A quick Google Image search of Siena, Italy will give you a good idea of the color of the city. No wonder I got lost. I remember noticing that all the gorgeous Italian girls who were PDAing like crazy in the Piazza Del Campo with their boyfriends had oddly huge underwear hanging out the back of their designer jeans. I remember getting hopelessly lost in the labyrinth of same-colored streets with some guy from Ohio – a romantic stroll that turned into a 2-hour lesson in not wandering aimlessly through a foreign town because you will get lost. And I remember that Siena was the point of origin of the hellish travel day that inspired parts of this post. But guess what doesn’t stand out in my mind: boiling spaghetti noodles in a pot of water. Seriously former self!? The suspense is killing me! I have no freakin’ clue what happened on that train ride. But don’t worry. I’ll always know that it was Jenn who sliced the baguette and that I found the cork screw. Good job former self, good job. I married a wise man – he was definitely on to something. 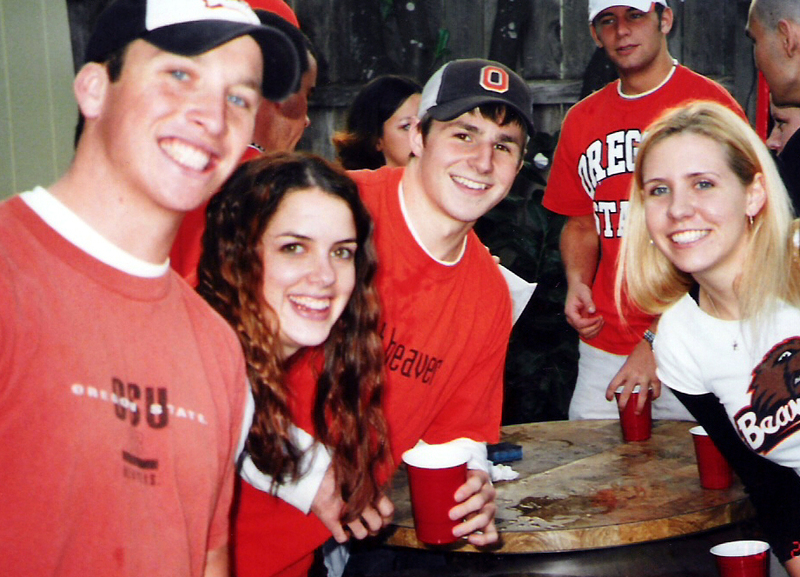 We were really young – too young to buy wine in the United States and being college students, we were more likely to score free PBR at a house party than Pinot Noir at a dinner party. Also, we both lived in a sorority where, for insurance reasons, we weren’t allowed to cook and instead, meals were prepared for us. We didn’t have apartments, we didn’t host dinner parties and we didn’t buy wine. But on this occasion, we were in Italia and we had made a meal and bought wine and it was really cool. As a thirty-year-old, it isn’t exciting to buy wine or make pasta – it’s a Tuesday night. But as a nineteen-year-old, our humble little dinner party was worth writing about – and so I did. Here’s a more typical college shot. Jenn and I, with friends, in game day garb drinking beer from keg cups. Sometime last year, fresh off an afternoon of typing up that journal, I got to talking to Jenn about our trip – which was over ten years ago. During a lull in conversation (probably when I finally paused to take a breath), she looked at me and said, “You sure remember a lot more about that trip than I do.” I quickly explained my journal-typing efforts thus reassuring her that she wasn’t developing early-onset Alzheimer’s. But her comment made me think, even if we don’t write down or snap photos of everything we see and do, it helps to have some kind of trigger to aid in reminiscing – otherwise, these memories will be lost altogether. Anything helps, whether it be writing a snip-it in a scrapbook or having a good remember-when session with an old friend who, over a decade ago, was there right alongside you, having the awesome experience of picking out pasta noodles in an Italian supermarket. I couldn’t have said it better myself. Now that Andy is traveling all over the world at a record pace and, more often than not, I’m tagging along, this sentiment is more poignant than ever. We’re spinning crazy fast in this amazing whirlwind and I don’t want to forget a second of it. I don’t want to forget the big things like running out of air while scuba diving in Honduras last January or the small things like how good German beer tasted with Duck Soup on those cold, snowy nights in Munich this last December. When Andy finished up his 12-hour shifts we spent many nights at Nam Nam, the Thai place just below our hotel. FYI, for reasons I couldn’t understand, their Pad Thai, which is listed as vegetarian, is made with chicken. I’m an omnivore so it didn’t bother me, but all you rabbits out there best be warned that when a menu has been translated from Thai to German to English – something is bound to go screwy. So now, I’ll utter the words I never thought I’d say. I want to be a hoarder – a hoarder of memories and moments… not mementos though, I’m not about to start collecting clutter. And even though the written record of my time in Siena isn’t exactly the most riveting read, I think it has a lesson in there somewhere – not to mention a bit of a laugh, even if it wasn’t supposed to be funny. So to all you folks out there who are cooking dinner tonight, I suggest you take a little extra care in fixing the entrée or maybe open up a bottle of the good stuff and remember that in the long run, the mundane parts of life can be just as special as the big stuff – and if it doesn’t seem like it now, ten years down the road, you might feel a bit differently. Taking time to make a memory is always time well spent. Frankly though, I don’t really see why I couldn’t have written about that crazy train ride too.